Various technology blogs and articles. Is Mobile in Ireland Destroying Infrastructure? Radioway Training Professional Training, Engineering, Labs, Workshops, Seminars. The Great Irish Broadband and NBS Scams. If any of these areas have Broadband or O2, Meteor or Vodafone 3G (even if EDGE only, but not GSM/GPRS) then NBS is not bringing Broadband, as you have what “3 Ireland” are bring already (3G Mobile Phone Network). Look out for your own local paper or Billboards and see if this is offering you something you already have! Should we complain to ASAI? If 3 Ireland can advertise their Mobile Phone Network like this, what category is two way Satellite @ 3Mbps? For those that have not been following the plot, the NBS was awarded to 3 who are simply using using their Mobile Phone network. 3 happened to need to do a major rollout right now anyway. Analysis Mason get €400 per Electoral District covered to “verify” by base station stats (which is no verification at all) that the ED is 95% population covered (indoor modems). If you are in an ED with more than 60% BB coverage then the Scheme does not apply. If your ED is NBS covered and you get the modem (USB 3G/HSPA stick) and it doesn’t “work”, up to 5% or 8%* are allowed Satellite (VSAT), but it’s a service from Avanti which doesn’t exist and may never exist. As users are added and people use the mobile phones on the mast the speed quickly drops and latency increases, so 1MBps may become only 100kbps after 6 months of growth. Real Broadband is typically 50ms max. The phone traffic has priority. The number of masts is less than 1/4 of what would be needed to meet contention requirements even at 1Mbps, even if only 30% signed up. Is this why the the Advert coyly does not say what Minimum speed and Latency Broadband is? Why does the Advert neglect to mention that the NBS “Broadband coming to your area” is in fact just a Mobile Phone mast and the modem is a regular “on the go” Mobile Internet Dongle rather than fixed Broadband that can be easily shared to the household or small office? Real Broadband has a 20Gbyte to 250Gbyte (30G to 100G typical) Cap or FUP over a month or rolling 30 days. Typically if you go over Cap you are throttled. The 3 Mobile Internet product is 12G Cap download and 3G Cap upload and excess traffic is about €50 a Gigabyte (retail, wholesale appears to be €250 a Gigabyte). So the Cap on the NBS is not at all like Broadband. Are 3’s claims here 100% clear and not misleading? * As part of the NBS contract 3 will deliver the following minimum speeds at launch at the edge of cell. Average speeds for customers will be higher. As discussed above those assurances are fantasy. More here as to why it’s not possible. 3 have no LTE licence nor any LTE spectrum, nor will any 3G/HSPA modem work on LTE. 3’s network is also ready to be upgraded to LTE or Long Term Evolution which is the next step in mobile broadband technology. 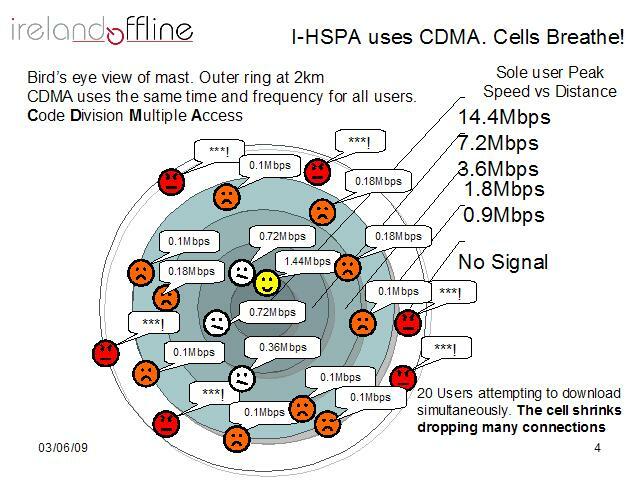 At 10 users simultaneously it can give the same per user speed as 14Mbps iHSPA at the cell edge. However contrary to what 3 say, Nokia suggest the minimum connect speed on iHSPA is about 50kbps. The operator can of course refuse connection if the speed would drop below 1.2Mbps. That would unfortunately equate to less than 3 people simultaneously downloading in a sector, typically. HSPA etc 50kbps upto 14.4Mbps. Its physically not possible to get much better than 2Mbps TOTAL sector throughput with a number of users across the sector area. Thus if a mast has 3 sectors a mast area (cell) can only have about 5 users at 1.2Mbps. The total number of subscribers then can’t be more than 180 for the 36:1 contention. If a 1/10th of those customers are on at peak time then your speed can be 1.2 / 3.6 = 330k. Except It’s W-CDMA based, the system loses capacity as users are added. some will not connect. The speed with all simultaneous will drop to about 150kbps at peak time if sold to 36:1 contention! For a 2km radius cell it’s about 25sq km area. IF NO PHONE CALLS. Phone traffic get priority and reduces the data capacity. With the capacity they are installing they need to have less than 10% take up and no voice traffic to scrape near the claimed performance. Even so many people will experience cell breathe which drops connections. Coverage can be up to 20dB poorer indoors if your window doesn’t face a mast. Random things clump. So some sectors will have only a few and others overloaded. This is less likely with fixed wireless systems that might have 16x to 40x the sector average throughput. (c) 2019 - Watty Stuff.